Sofia Lesaffre, Stéphane Bak, Jean-Stan Du Pac et al. When 16-year-old Leila (Sofia Lesaffre) wakes up late one morning, she finds the neighbourhood silent and deserted. Everyone has mysteriously disappeared. Starting to wonder if she was the unique survivor of an unexplained disaster, Leila discovers four other teenagers: Dodji (Stéphane Bak), Yvan (Paul Scarfoglio), Camille (Kim Lockhart) and Terry (Jean-Stan Du Pac). Together, they will try to understand what happened and learn how to survive in their world which has become hostile... 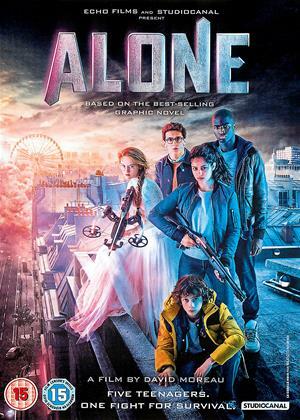 But are they truly alone? In a long tradition of films which emulate dream states or states of limbo this one isn't bad. It does get bogged down in a trudge towards the denouement and ends up being about half an hour too long...(is this a rather common factor with French films perhaps?) Good characters and well acted and not badly filmed. The story itself is muddled rather than mysterious with many unexplained devices and ultimately unexplained behaviour on the part of some of the characters.